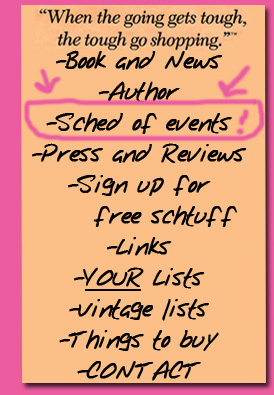 Oh-so-many fun-filled events have come and gone. Check back for mo' to come! Cost: $50 per person, includes book, dinner, dessert, and one complimentary drink. Registration and pre-payment required at 480-730-0205. COME HANG OUT WITH ME! LET'S HAVE DINNER TOGETHER! 9/11/08 :: PART 2 of NPR's Day to Day INTERVIEW! So after my last interview, tons o' peeps sent in their shopping lists and I picked one. I created a NEW SHOPPER based solely on the list, and was photographed as "JEFF." Hear part 2 of the interview, along with some comments from the real listmaker, and see the actual pic of him, along with the pic of who I imagined the list belonged to!!! GO NOW! Check your local listings for time OR read the story and listen online (complete with an A la Cart slide show!) GO NOW! 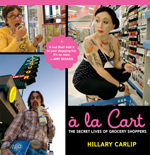 Featured book on MySpace, including a supah special blog with video explaining a BIG, PHAT A la Cart SUPERMARKET SLEUTH CONTEST! And April 30th, I'll be part of a Memoir Panel at Changing Hands. Mo' info to come. 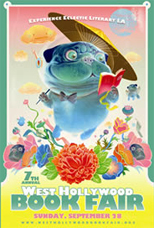 Literary Rock & Roll -- Reading and performing with Junot Diaz (The Wondrous Life of Oscar Wao); ZZ Packer, and more!